One of my son’s favorites is pizza so we try and have a pizza night once a month and he helps out with rolling the dough and making his own dinner. I use a recipe from Patricia Wells Trattoria which is easy and foolproof. 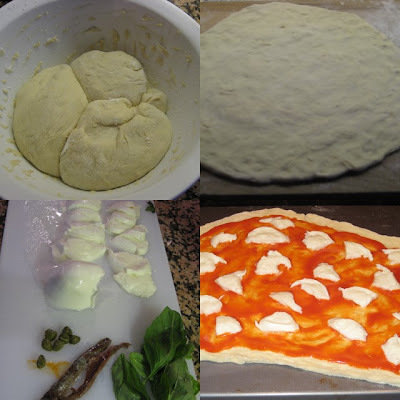 We each make our own using tomato sauce (usually bottled passata), mozzarella di bufala and basil. If there are some anchovies and capers then we add those too. In a large bowl, combine the yeast, sugar and water and stir to blend. Let stand until foamy, about 5 minutes. Stir in the oil and salt. Add the flour, a little at a time, stirring until most of the flour has been absorbed and the dough forms a ball. Transfer the dough to a floured work surface and knead until soft and satiny but still firm, 4 to 5 minutes, adding additional flour as needed to keep the dough from sticking. At least 40 minutes before placing the assembled pizzas in the oven, preheat the oven to 500⁰F (260⁰C, gas mark 9). If using a baking stone, preheat it. Punch down the prepared dough and divide it evenly into 4 pieces. Shape each piece into a ball. On a lightly floured surface roll each ball of dough into am 8-inch (20 cm) round. Sprinkle a wooden pizza peel (or baking sheet) with coarse cornmeal and place the rounds of dough on the peel or sheet. Working quickly to keep the dough from sticking, assemble pizzas. We brush on tomato sauce, top with sliced mozzarella di bufala and a few basil leaves for a Pizza Margherita. For a Pizza Marinara, we add capers, halved and pitted black olives and minced anchovies. Sometimes, we just brush olive oil and sprinkle coarse sea salt and rosemary for a Pizza Bianca. Slide the pizzas off the peel and onto the baking stone (or place the baking sheet on a rack in the oven). Bake until the dough is crisp and golden, 10 to 15 minutes. Remove from the oven, transfer to a cutting board, and cut into wedges. Serve immediately. Oh my gosh. Looks so good! Will definitely try it out some time and post pics. Might not look as good though. LOL.